අබ්දුල්ලා වලීඩ් අංක එකෙ වලත්ත කෆීර් කෙනෙක්, හැබැයි අවු.18 කට කලින්. ඌ බැන්ද ඉස්ලාම් වේෂියෙක්. නිවුන් කොල්ලො දෙන්නෙක් මූට අල්ලා තෑගි කලා අපායෙන් ගොඩ අරන්. දෙන්නම ගන්න දෙයක් නැහැ. කකුල් සොත්ති පව්කාර ලෙබි කොල්ලො දෙන්නෙක්. ඊට පස්සෙ මූව කෆීර් සමාජෙන් හිමීට අයින් කර ගන්න වේෂි සමත් වුනා. හරියටම කඩුගන්නවෙ ගුණසේකරට කලා වගේ. ඒ වේෂිගෙ මූණ හරියට පිරිමියෙක් ගෙ වගේ. ඌ එහෙන් මෙහෙන් දැක්ක අපේ කොනකපාලයො බඩු ගහන හැටි, කෑදර කම ඉහ වහ ගිහිල්ල මාරු වුනා ඉස්ලාමෙට අවු. 3 කට පස්සෙ, මොනවටවත් නෙවෙයි, පට්ට ඉස්ලාම් වේෂියො සෙට් එකක් තියන් පුකේ අරින්න. නමුත් ඌට පවු පල දුන්නෙ පලමු වේෂි බැන්ද වෙලේ පටන්මයි කියල තේරුනේ නැහැ ලමයි දැක්කම වත්. තවත් ඉස්ලාම් වේෂියෙක් වෙන කෙල්ලෙක් හදා ගත්තා. දැන් මූ හන්ටර් වෙලා පුක බිම ඇනගෙන හිඟා කන්න සෙට් වෙලා. මදැයි අපේ වරිගෙ ඔළු ගෙඩි ගාන වැඩි කර ගන්න කෆීර් එකෙක් කන්වර්ට් කර ගත්තා. මූ දාර පොන්නයෙක්. මල කරදර කොල්ලො දෙන්නෙක් ඉස්ලාමෙට වැඩි වුනා. මූට ඉතින් උදව් කරලත් වැඩක් තියෙනවද ඉතින්. මේ ඌ අනික් හම්බයන්ගෙන් උදව් ඉල්ලල එවපු මේල් එක. අපි කවුරුත් එකතු වෙලා මෙහෙම පොන්නයින්ට උදව් කරන්න ඕනෙ. කැරි අල්ලත් මූට පස්ස හරෝපු එක තමයි මට තියෙන දුක. I, Abdullah Waleed of No. 34/2, Geediwala Junction, Danowita, Mirigama, take this opportunity to explain the dire situation of my family. 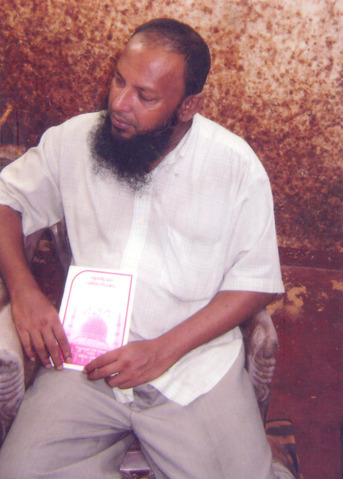 I became a Muslim more than 15 years ago. I am with two sons and a daughter, aged 17, 17 and 7. 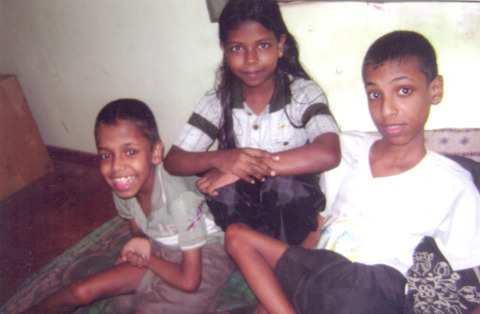 Two sons are severely handicapped, unable to move even to the wash-room. I have to be by their side most of the time and due to this I am unable to work outside the home. As the sole breadwinner, I have to bear the brunt of caring for the children and feeding the family. 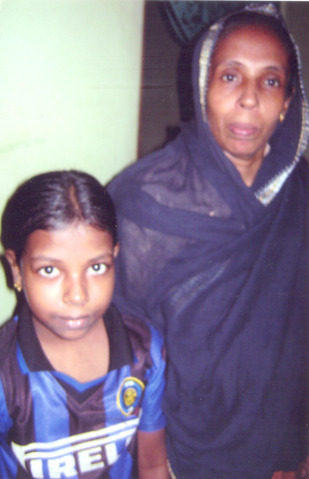 Due to frailty my wife too is unable to attend to the needs of the children. We are deprived of any source of income. I seek the assistance of generous brothers and sisters. Photos are attached.